Ready, set, go! And their off…coming around the first turn we have Leesa and the Tempur mattress. It looks like it’s going to be a tight race here folks! Does one of these companies have what it takes to win the race? This week Sleepopolis is putting Leesa and Tempur to the test. Is Leesa going to be able to compete with the veteran Tempur? Keep reading and you’ll find out! In a bit of a hurry? Click here to slide down to the review summary. Unfortunately, Tempur does not currently have any active promo codes with Sleepopolis. The Leesa mattress is designed from 3 different layers of foam and is 22cm deep. 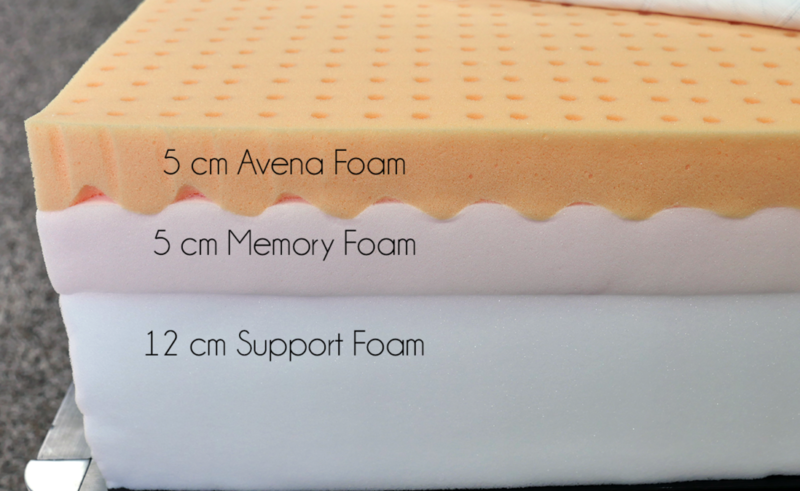 Top layer (comfort + cooling) – 5 cm of Avena foam. 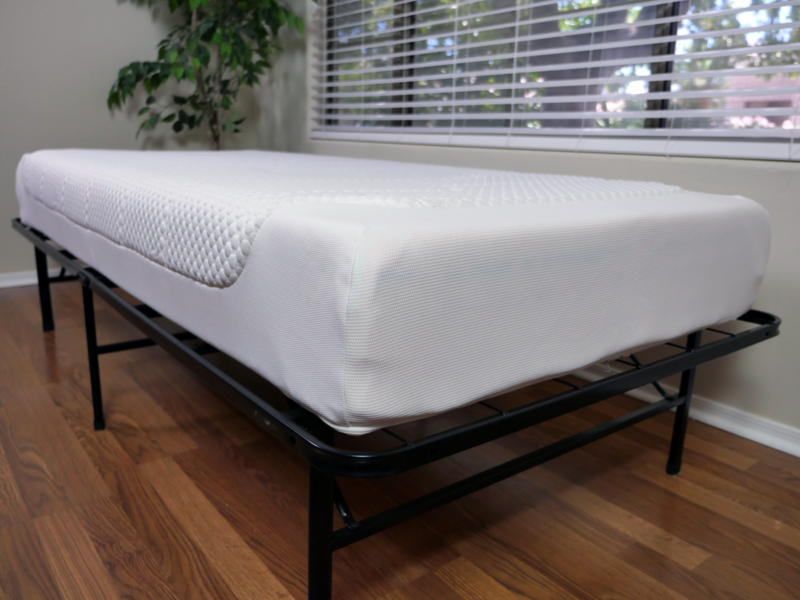 Avena foam is a latex alternative and provides the bounce as well as airflow helping keep the sleeper cool. This top layer is aerated with small holes on the top and air-flow channels along the bottom. Middle layer (support + pressure relief) – 5 cm of memory foam. This layer provides the body contouring as well as the pressure relief for the sleeper. Base layer (foundational) – 12 cm of high density support foam. The bottom layer acts as the foundation for the mattress. This layer also provides a certain degree of deep compression support, which is especially important for heavier sleepers. The cover of the Leesa is constructed from a single piece of fabric, which contains a blend of polyester and Lycra. The mix of these two materials allows for a durable cover in addition to good elasticity and cooling. Due to being woven from one piece of fabric, the cover fits tightly around the mattress, giving it a sharp, clean look. Similar to the Tempur, the Leesa’s cover is slightly thicker than most. Yet, the polyester-Lycra material used is actually the same material used in performance sportswear, therefore helping to maintain a cool sleeping surface. From an aesthetic standpoint, the Leesa mattress contains one of the most unique covers we’ve seen thus far. The grey color scheme and 4 white bars at the foot of the mattress help create a sleek, modern aesthetic. The Leesa mattress has a medium feel, landing at a 6 out of 10 on the firmness scale, where 10 is the most firm. 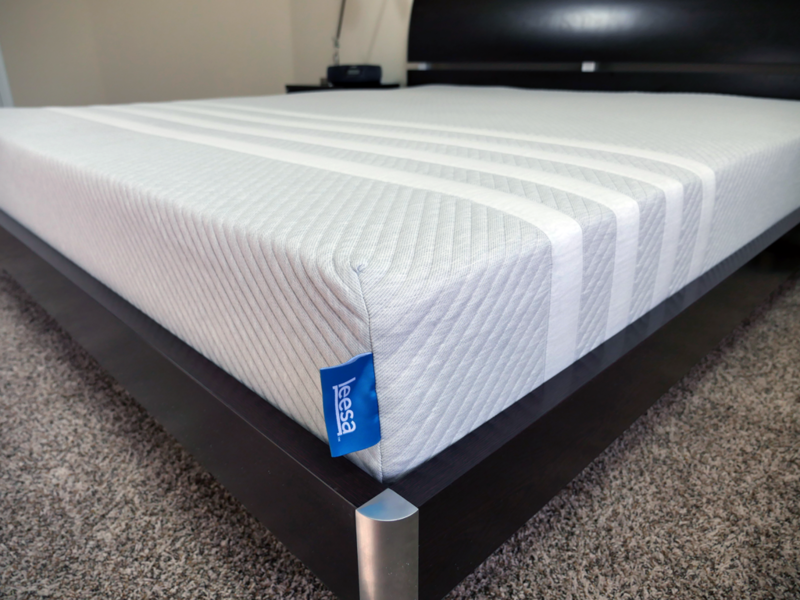 Leesa’s goal was to create a “universal comfort” mattress and they have done an excellent job of creating a nice balance between comfort and support. Upon initial contact with the Leesa you notice a nice degree of softness, comfort, and cooling from the top layer of Avena foam. Avena foam is similar to latex, yet it tends to have a longer lifespan. Leesa provides the sleeper with a balanced level of hug and contour without swallowing them in the foams. Along with that comes a quick response time. Leesa responds to pressure much quicker than most foam beds, such as the Tempur. This is an added benefit in terms of bounce and amorous activities as well as changing sleeping positions during the night. Most importantly, the support of the Leesa is top notch. Throughout my sleep test I slept on my back, stomach, and side and felt as if the mattress was able to support me equally in each position. From the high levels of support and comfort to the impressive cooling properties, the Leesa does a great job of providing both quality and enjoyable sleep. Not to mention, with their low price point it’s hard to compete with the value of this mattress. See full Leesa mattress review here. The Tempur Cloud Deluxe 22 mattress sits at 22 cm tall and is built from 4 separate layers of memory foam. Top layer (comfort) – 1.5 cm of super soft visco elastic memory foam. This is more of a welcoming layer as it adds a degree of softness to the top of the mattress. 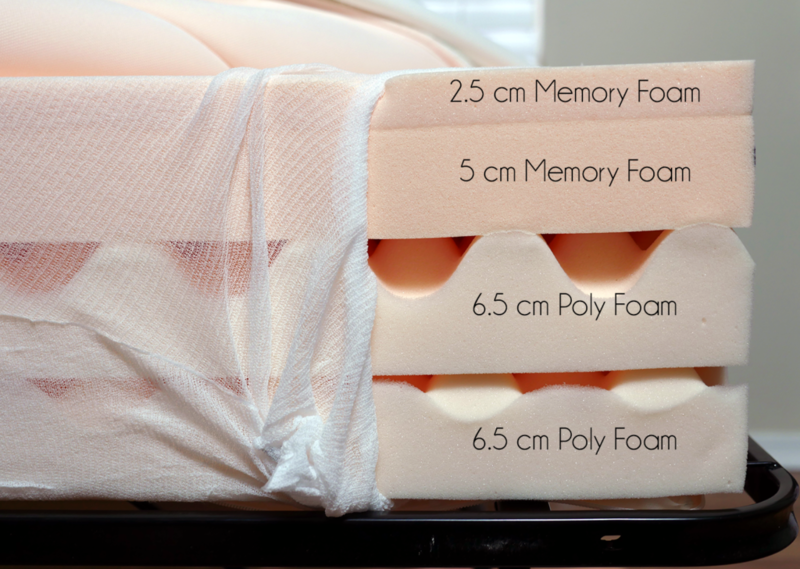 Second layer (comfort) – 2.5 cm of visco elastic memory foam. The second layer of memory foam is designed to provide comfort for the sleeper. As a very soft foam, this layer also provides a deeper level of sinkage and hug. 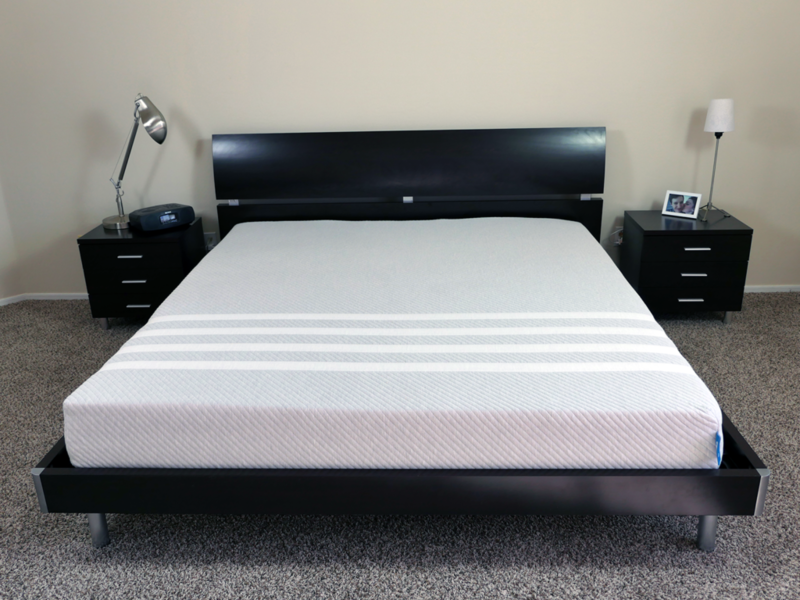 Third layer (comfort + transitional support) – 5 cm of visco elastic memory foam. Placed under the second layer, this layer is designed to provide a high level of pressure relief. With a slightly quicker response time than the second layer, it is able to act as a transitional support layer as well. Fourth layer (support) – 6.5 cm of polyurethane foam. 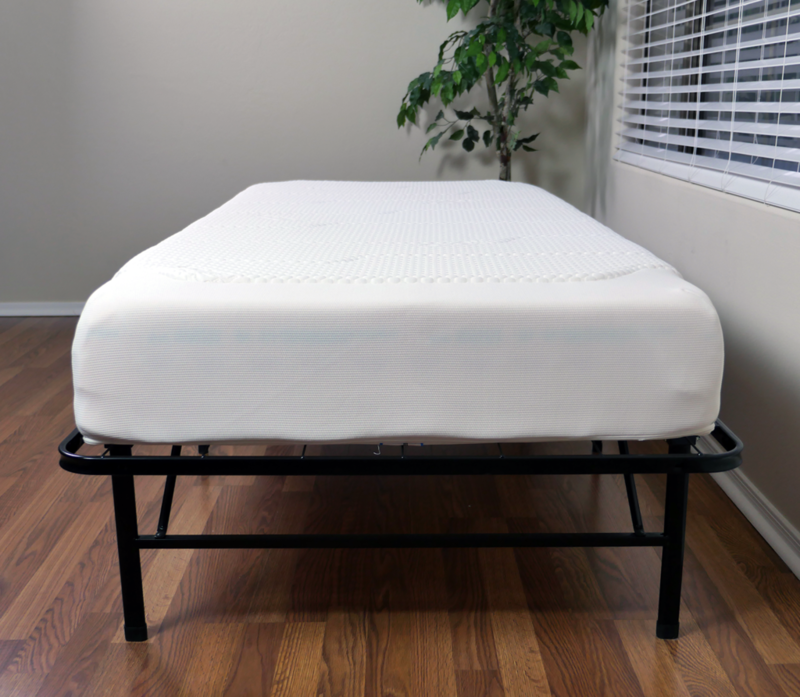 With a denser foam, the fourth layer of this mattress acts to provide support. This layer is also highly breathable, helping to keep the sleeper cool. Bottom layer (support + foundational) – 6.5 cm of polyurethane foam. The bottom layer seems to be identical to the fourth layer. This just adds even more support to the mattress and aids in deep compression support for the sleeper. The cover of the Tempur Cloud Deluxe mattress is built from a blend of polyester (98%) and Elastane (2%), which make up the top of the cover. The sides and bottom of the cover are 100% polyester. Along with these materials, there is a layer of super soft foam quilted within in the cover. The combination of these materials makes for a soft and responsive cover. The Elastane, also known as spandex, and polyester do a great job of popping right back into shape after being tugged on from several angles. These materials add a nice degree of elasticity as a whole. From a visual perspective, the cover is basic. Tempur used an all white design with a dotted pattern / texture and embossed “Tempur” logo. The Tempur Cloud Deluxe mattress strikes a slightly different feel than most mattresses I have tested. On a scale of 1-10, where 10 is the most firm, this mattress sits at a 5 out of 10. For starters, the Tempur mattress offers a deep level of sinkage and hug, resulting in an impressive level of body contouring. That said, the response of the memory foam used in the Tempur is quite slow. There is less of a stuck feeling with this mattress compared to some of the more traditional Tempurs, but if you’re a sleeper who does not enjoy the deeper level of sinkage and hug this is most certainly something to keep in mind. Although, this mattress does do an excellent job in terms of pressure relief. I did not feel a single pressure point between my body and the mattress during my sleep test. Next up, support. While sleeping on my stomach, I did feel as if the mattress was a touch to soft, creating deeper sinkage around my waist and a less than an ideal spinal angle. Yet, as I slept on my back and side the support was solid. Both of these positions felt much more supported and my spine was more appropriately aligned. As a side note, sinkage levels will vary depending on weight. As a lighter sleeper (10 stones) I was still seeing a deep level of sinkage, around 9.0cm on my side. Anyone over my weight will see even more sinkage, so this is another area you’ll want to carefully consider. Finally, cooling. With such deep levels of sinkage the cooling characteristics of this mattress were average. The Tempur did not sleep excessively hot, but the deeper sinkage and hug may cause some sleepers to feel warm, especially the heavier sleepers who will tend to sink even more so. See my full Tempur mattress review here. Should I buy the Leesa or Tempur mattress? Now for the question we’ve all been waiting for…should you buy the Tempur or Leesa mattress? After several sleep tests and deep analysis of each mattress, I must say that Leesa is the winner of this mattress battle. When considering the sheer material, performance, and overall build quality for the price you pay, the Leesa is hard to beat. By no means is Tempur a bad mattress. They still perform at a high level and use top notch materials. Yet, at ~£1,750 for a King size, the Tempur is simply not worth the money in my opinion. I would much rather spend £750 for a Leesa mattress (King size) and receive a longer trial period, customer service directly from the company (as opposed to from a retailer), and save myself £1,000. Want a medium firmness – the Leesa comes in at a 6 out of 10 on the firmness scale, with 10 being the most firm. Leesa’s goal was to create a mattress that is suitable for a vast majority of sleepers. Want a balanced feel – Leesa strikes a great balance between sinkage and hug as well as comfort and support. As a mattress with good cooling and responsiveness, the Leesa his that “just right” feel for more sleepers. Want a foam mattress with good bounce – the top layer of Avena foam used in this mattress is extremely responsive, adding a nice degree of bounce to the mattress. This can be a major benefit for amorous activities as well as those sleepers who want to avoid that “stuck” feeling that most traditional memory foam mattresses offer. Want to purchase from a company with a heart – for every 10 mattresses sold, Leesa donates 1 to homeless shelters and others in need. Not many companies go out of their way to make a difference in the community so it is very cool to see Leesa making a big effort to making a positive impact on the community. For more information on the Leesa mattress, visit Leesa.co.uk. Want a soft to medium feel – at a 5 out of 10 on the firmness scale the Tempur has a soft to medium feel. Want a deeper level of sinkage – the Tempur’s memory foams allow for significant sinkage and a pronounced hug around the body. Even a light sleeper like myself sank around 9.0cm into the foams while lying on my side. Want slower responding foams – the Tempur’s memory foams are slower to respond. For some sleepers this can create an uncomfortable stuck feeling. Do not have budget concerns – if money is no object and you like the feel dynamic that the Tempur Cloud 22 is able to create then it can still be an excellent choice. If you’d like to read up a bit more on the Tempur mattress, visit UK.Tempur.com.